Julio José Iglesias de la Cueva was born on 23 September 1943, in Madrid, Spain, of Puerto Rican, Galician (Spanish) and Jewish descent. As Julio Iglesias he is a well-known Spanish singer and songwriter who has gained international success during more than 40 years in the musical entertainment industry . He initially rose to prominence in the 70’s and 80’s, but is still extremely popular. He is the father of the singer Enrique Iglesias, who is also famous. Iglesias has released 77 albums which have sold an estimated 300 million copies. So is Julio Iglesias rich? In fact there is no question about whether Julio Iglesias is wealthy, because he is recognised as the best selling Latin artist of all times; Julio Iglesias is estimated to have a net worth of $300 million. His assets include several hotel complexes and the Punta Cana International Airport. Julio Iglesias was not always interested in music.He actually studied law at CEU San Pablo University in Madrid, and interestingly, Iglesias also played football there, and was then a goalkeeper in “Real Madric Castilla” football club. Being a successful player Iglesias earned quite a lot of money, which added to his initial net worth. Unfortunately – or perhaps fortunately for music lovers – after a car accident Iglesias had to relinquish his football career, as for a while he could not even walk. While in hospital Julio became bored, and learnt to play the guitar to help pass the time. He enjoyed playing and singing, and therefore decided to pursue a different career and to become a singer. Julio Iglesias gained prominence when he became the winner of the Spanish “Benidorm International Song Festival” held in 1968. Iglesias continued performing in other music festivals and contests, and then signed with “Discos Columbia”, a distribution of Columbia Records. In 1970 he represented Spain in the “Eurovision Song Contest”, where he was fourth with the song “Gwendolyne”. 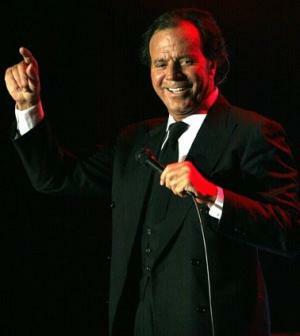 As a result, Julio Iglesias became famous in Europe, especially in Germany with his single “Un Canto A Galicia” and in Italy with the song “Se Mi Lasci Non Vale”. Therefore, Julio Iglesias not only built a widespread loyal fanbase, but also considerably increased his net worth. In 1979 after divorce, Julio Iglesias decided to move to the United States. Iglesias signed with “CBS International” and started releasing non-Spanish albums. Consequently, he became very popular in the United States; his album “Bel Air Place” sold more than million copies in the United States alone. These sales obviously added to the overall amount of Julio Iglesias net worth. In total Julio Iglesias has now released over 80 albums, the majority of which have been certified Platinum or Gold. An indication of Julio Iglesias’ continued popularity is that in 2012 he performed a concert in Equatorial Guinea, where tickets were reportedly $1,000 each. In 2013, in Beijing he received two historic awards: First & Most Popular International Artist of All Time in China, an award given by Sony Music China, and also a Guinness World Record for the Best-selling Male Latin Artist. The same year, he was inducted into the Latin Songwriters Hall of Fame. In his personal life, Julio Iglesias was married to Isabel Preysler from 1971-79 and they have three children: Chabeli Iglesias, Julio Iglesias, Jr. and Enrique Iglesias, who is a well-known singer. Subsequently Iglesias lived with the Dutch model Miranda Rijnsburger before they married in 2010; the couple have five children. At the moment Iglesias and his family live in the Dominican Republic. Julio Iglesias net worth is 850 million euro!Stop copy wrong information from other sites!!!!!!!!!!! !